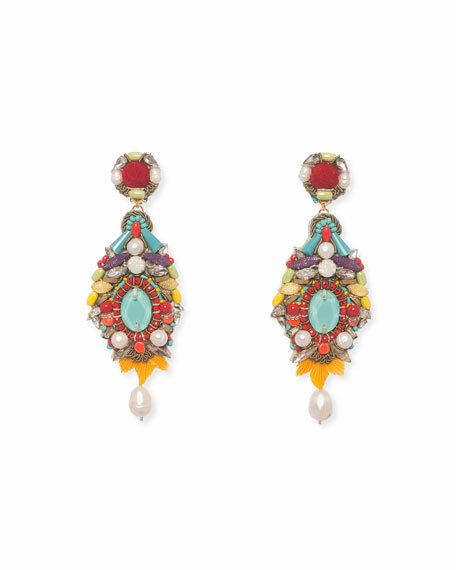 Pelican drop earrings by Ranjana Khan. Round post with pompom center. Leather backed drop with beading. Born and raised in India, New York-based designer Ranjana Khan applies her vast knowledge of embroideries to create iconic pieces of jewelry and accessories. Since founding her eponymous line in 2008, she has become one of the world's greatest authorities on embellishments, sharing her unique insight and experience with renowned couturiers. For in-store inquiries, use sku #2547364.